Such is the backstory to ‘Watching You’. Trailered as an EP but boasting a generous eight songs and clocking in at forty-one minutes The Deep’s latest release is not only an exciting addition to their canon but is also a strong contender for metal assault of the year. By hiving off this new material and releasing it separately Tony and his bandmates Paul Smith and Mick Feleppa (guitars), Phil Reeve (bass) and Alan Mogg (drums) have put together a clutch of robust, memorable and truly electrifying songs. Tony reckons they are more commercial than the band’s usual output, but in fact they’re just more accessible and extremely catchy, written with an eye on the finish line and an ear for strong melody. ‘Prepare To Rock’ – a tribute to those murdered at The Bataclan – is perhaps the best of the bunch, a true exhibitionist with pace, flair and a cracking solo, but that’s not to dismiss the others. ‘Dead Man Walking’ keeps the tempo but lyrically examines how you can take control of your own life, while ‘Watching You’’s acoustic intro suckerpunch gives way to a low-key chorus reflecting the paranoia of the lyrics. Rounding off this fresh quartet, ‘Taking Over’ gears things up once more and offers up what Tony calls “a tongue-in-cheek look at the madness of world politics” set to a pounding backbeat and a chorus line which calls to mind Judas Priest’s ‘The Sentinel’; if this one doesn’t get your feet keeping time you’d better check you’ve still got a pulse. And that’s just the first half of this coat of many colours. 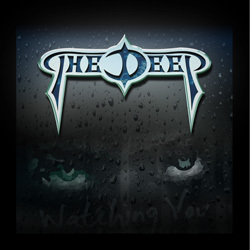 The second half of ‘Watching You’ serves up four songs from ‘Premonition’, recorded live at the British Steel festival in Fisme, France, in October 2016, and as you’d expect from a band of this calibre, in a live setting the songs really come to life. If you’ve got The Deep’s debut you’ll know just how good ‘The Rider’, ‘All I Want’ ‘Night-Stalker’ and the title track are, and it’s ‘Premonition’ itself which kicks off this short but bracing snapshot of the band’s set with its dual guitar runs and Maidenesque intent. Just listening to this now makes you think what a show it must have been on the day. While staying true to their roots but coming at things from a contemporary point of view The Deep continue to prove that they have a lot to offer metal in the twenty-first century. Who needs to teach old dogs new tricks when they’re more than able to show the young pups a thing or two?